It’s Your Call: 2CC Talk Radio With Teeth! That headline could just as easily have read “Newish Manager Doug Bell Puts His Stamp On 2CC”, but I think the first headline works better. So what am I going on about? Well 2CC have new imaging which presents them as a “hard-hitting” news and current affairs station, apparently they “aren’t afraid to ask the hard questions” and 2CC is “talk radio with teeth”. The new imaging is putting heavy emphasis on local programming, with promos for Mike Jeffreys and Mike Welsh on high rotation. The background music on the promos sounds a bit more serious than the old promos, but not serious enough to sound like a news bulletin, which is probably a good thing. New Day Australia now has at least three ad break intros, all replacing the one ad break intro used for years and years and years. My favourite is “It’s your call, New Day Australia on Talk Radio 2CC”. As it turned out during the day, “It’s your call” is the catchcry of 2CC and is featured in almost every station ID. The open line number also features quite heavily, and in what I think is a first for 2CC, network programming is receiving voiceovers touting “13 13 32” as the open line number. There are a couple open line promos floating around which sound a bit snappier than the previous ones, and don’t have a rushed voiceover. 2CC production have obviously had a lot of fun and put a lof of effort into the new imaging, and some bright spark has decided to use snippets of Lawsie’s jingles in the place of the old music returns which used to clash with Lawsie’s own music returns. The jingles still overlap Lawsie’s music, but the transition from end of jingle to music return actually works surprisingly well. On the subject of music returns, it sounds like 2CC have updated their music returns (the bits of music they play as they return from ad breaks if you’re wondering what I’m going on about) as well, a new set, it’s probably about time too. Unfortunately it still drowns out overnight programming when it returns from ad breaks, but overall it sounds more serious and focussed than the previous set. A little while back 2UE dumped the half-hour “Best of Laws” segment at 11:30 Friday in favour of a “Five Days in Five Minutes” segment at 11:53. This has undoubtedly presented extra work for 2CC who have a locally produced hour-long “Best of Laws” segment on Sunday’s at 9am. I’ve been thinking about this, and now that 2CC have new imaging, I have to wonder if “Best of Laws” will be dumped in favour of “The Best of Mike Welsh” or (and this would be a tad odd) “The Best of John Stanley”. It would probably take the same amount of production, but would fit in with 2CC’s new-found local emphasis. As fas as I can tell, the new imaging was launched as of Midnight, and is probably an early birthday present for 2CC, which turns 31 tomorrow. Canberra Centre Expansion Opens This Week! The opening of Canberra Centre Expansion on Section 84 takes place on Thursday, and as such I have decided to cancel the detailed October photographic update. In it’s place I have taken a short set of photos, firstly of the construction as seen from Mount Ainslie, and secondly of the stores moving. Again I ask that you remember the copyright and licence associated with these pictures. If you would like to use these pictures outside of those conditions, please contact me and I’ll see what I can do. While I was up on top of Mount Ainslie, I took the opportunity to take a photo of the underground cabling building a few minutes walk away from the Canberra Centre. More information about this building can be seen by clicking here. 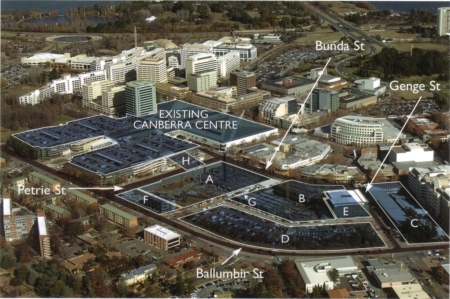 The next photo is an overview of the Civic Area, with the Canberra Centre and it’s expansion in the middle. Then we have the large office building which will have retail on the lower floors. This building is undoubtedly the main retail building, and will also have plenty of carparking spaces, including on the roof. I seem to recall the hole that was dug in the ground for this building went down about three storeys, so it will be interesting to see what has been done with that space. The main change to existing stores is that virtually the entire City Markets is moving to a new “Fresh Food” section. The sole supermarket Supabarn is moving to newer, and apparently bigger premises. I was under the impression that Woolworths were moving in, although the Canberra Centre seem to be making no mention of it, so I’m no longer 100% sure about this. Supabarn have signs up at the checkouts announcing their move, and further signs inside the store apoligising for the low stock levels while they move. Bakers Delight are also moving, but it looks like they’ll be closing for a few days while they move their baking equipment. The City Market Chemist are one of the stores offering a relocation sale in an effort to offload as much stock as possible, obviously not wanting to cart it all over to their new location on the corner of Bunda and Petrie Streets. When I took these photos of signs on Sunday afternoon, hair care store Price Attack were already closed and carting stock to their new location. Dobinsons are an interesting case. Dobinsons are one of the cafes on Bunda Street, they are not moving, but they will be opening a second store in the new shopping centre, apparently it will be called “Dobinsons Express” and will only offer takeaway food and coffees. It will be virtually the same store, just without the dining. Another store which is moving is the health food store, Healthy Life, they are also offering a relocation sale. JB Hi-Fi and Ted’s Cameras (Thanks to RiotACT for the latter) are among the stores moving from other locations in Civic to the new Canberra Centre. Bunda Street is being transformed into a large al-fresco dining area…and at long last, Petrie Street will re-open this week (in theory). Select Meats, the City Market butcher, is not moving, and has already closed, at the decision of the owners. I will be contacting Canberra Centre Marketing today to arrange press access for Samuel’s Blog to the opening of the Canberra Centre Expansion, which will, apart from the remaining office block and another photographic tour of the outside of the expansion, round out the series of construction updates. People who have been reading this blog for a while would remember that I’ve been running a series of photograpic updates on various constructions in Civic, mostly the “Section 84” constructions, which include the expanded Canberra Centre. Right near the end of August I took a whole heap of photos on a Sunday afternoon, and then completely forgot about them, the photos have been sitting on the webserver just waiting to be used for a lot of that time, and so today, as the completion of the Canberra Centre draws near, I will finally catch up on that set of photos. As it is currently October, I am due for another round of photos, but I have decided to hold off until the opening of the expanded Canberra Centre later this week. Many stores are already in the process of moving, and stay tuned because I have plenty of information about that, plus photos, coming up at 10am. But right now, here are the photos I took on Sunday August 27. I will, however, repost the map, as this will help to explain where each photo is. Clicking on any photo in this post will take you to a large version of the photo. I also remind you of the copyright on these photos. I am happy for you to reuse the photos as per the conditions of the licence, however I ask that you give me credit for the photos. If you wish to use the photos outside of those conditions, please contact me and we may be able to reach an arangement. Firstly we have some photos from the existing Canberra Centre car park. Sections of the existing car park have been blocked off so that the shopping centre can be expanded in it, as part of this the main office has been moved, and lifts have been partially shut down. In August, both lifts where fully operational, but further areas have since been blocked off. More of H and A. It looks like H will be a footbridge, possibly contaning a store or two, as well as a vehicle bridge between the existing and new car parks. This photo of A and F is quite interesting. On the left you can see the carpark and loading dock exits of A, in the centre you can see F, the skate park and above (in terms of the photo) that the Youth Centre, home of Raw FM, as well as Ballumbir/Cooyong St on the right (ACT Planning and Land Authority can call it what they want, as long as the signs are wrong, and their logic is wrong, I’ll call it both names). Just for the fun of it, here’s a photo from the existing Canberra Centre looking down Ainslie Avenue. Having completed my photos from the City Markets side just after official Canberra Centre closing time of 4pm, I headed off to Bunda Street for more photos. Here we see the City Markets side (backs on to Petrie Street) and it is quite clear that some floors have been closed off for shopping centre construction purposes. Incidentally, a number of the stores on the bottom floor in these photos were closed for a few weeks during winter so that the pylons could be strengthened. On the corner of Petrie and Bunda streets there is a transformer/substation which has, up until now powered the City Markets, it is being replaced by a larger transformer/substation at the other end of Petrie Street (photos further down). Obviously, with the upper floors now needing enough power to sustain shops, and not just a bunch of lights, the existing transformer/substation is not adequate. The area on the corner where the substation/transformer is currently located is being turned into a chemist. Signs…and it doesn’t look like anybody is paying attention to ACTPLA’s renaming of Ballumbir Street! The newish, colourful, waste of badly needed budget finances street signs of Civic. Section A with Section B in the background. Section B with Section A visible to the right. A photo taken with the camera looking through gap in fence. From left to right, section A, section H and existing transformer/substation. Section H has overtaken the old Supabarn loading dock and staff carpark, the trucks have been using a makeshift entrance on the other side of H.
Looking up into the former carparking space, and the ceiling material is in place. I then walked along Bunda Street making use of the peepholes. Despite there being plenty of light, it just wasn’t quite enough for the camera to be happy to use a short exposure. So I turned on the flash and despite the flash mostly bouncing off the boarding around the peephole…voila! It looks like there will be some escalators along the Petrie Street side. And some small retail areas along Bunda Street. G, the connecting bridge between A and B.
B…it has a tall office section which probably has some very nice views over Braddon and Reid. More peepholes and fence on Bunda Street for photos of B. Up the top you can see an air conditioning plantroom. Looking back down Bunda Street with B and A on the left. Across Genge Street is C, an office building with some retail bits. On the day I took these photos, some areas around E, The Griffin Centre, were blocked off. One thing that intruiged me was the unusual Y shaped pylons being used. A sign pointing to B.
Here’s one of those Y shaped pylons. It is straight for the few underground levels, and then branches out at ground level. The peepholes along the alley behind C were most helpful. I think it’s a good thing we don’t see lift shafts like this when they’re in use. Another peephole looking at C (and another Y shaped column), in the background is E and B. Quite clearly the underground levels will be used for carparking, probably for the office workers. B from the corner of Bunda Street and Genge Street, or thereabouts. More of B. The bottom few floors will be retail space, with the upper floors being office space. Looks like the office workers here will also have underground parking. Looking towards A from C. That side A will have a loading dock entrance and a carpark entrance. When I was taking these photos, bits of Ballumbir Street in front of F were closed, probably so that entrance and exit lanes could be marked. Also, Telstra were busily installing phone lines at the time. A, G and B from Ballumbir Street, further left than the photo is the Supabarn and Big W loading dock. At the bottom of this photo of A, you can see the entrance to that loading dock. I still think the Youth Centre looks ugly. Looking down Petrie Street from Ballumbir Street. The blue fenced off area is where the new transformer/substation is going. The carpark exit plus the Big W/Supabarn (and probably others) loading dock as seen from the corner of Petrie and Ballumbir Streets. Looking into the loading dock area from Petrie Street. And up the down ramp! Parking has been a tad confusing with half the road closed. Just behind the green bush to the left of the photo you can see the interim entrance to the existing Supabarn loading dock. The site being ripped up for use as a transformer/substation on the corner of Petrie and Ballumbir Streets. On the map at the top of the post you can vaguely see the carpark of a large football and leagues club under the words “Ballumbir Street”. On the night of taking these photos I went to the other side of the football oval with the camera and a tripod and took a series of photos of the construction site. First up is a photo of the crane…but the camera moved during the photo. And an overview of everything. And that’s that. The belated August update.